MSA steel and composite compressed air cylinders meet a wide range of applications, needs, and budgets. Composite cylinders with aluminium liner, over wrapped with carbon and glass fibres, are 50% lighter than the traditional economic steel construction. 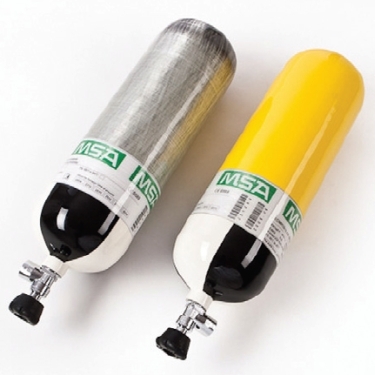 MSA offers cylinder versions with 200 and 300 bar service pressure and 2 to 9 litre capacity. Additional safety is provided by a full choice of valve options such as integrated gauge, ratchet hand wheel to prevent unintended closing and flow restrictor in case of valve breakage. All cylinders are manufactured and CE marked in accordance with the requirements of the Pressure Equipment Directive 97/23 EC. MSA compressed air cylinders are equipped with cylindrical thread M18 x 1.5. The valves are approved according to EN 144. They are made of ductile high-performance chromed brass which is resistant to impact load of up to 200 Joule and temperatures of up to -40 °C. Furthermore MSA offers valves E17con with conical thread as spare part for steel cylinders. Cylinder valves with ratchet hand wheel, available as an option, avoid inadvertent valve closure which may occur in confined space environments. For closing the valve the hand wheel must be pulled and turned at the same time. The optional available flow restrictor prevents uncontrolled flow in case of valve breakage. It is screwed into the valve instead of the protective tube or sintered filter. Once the valve is broken a spring loaded piston nearly seals it and the air can escape slowly. The flow restrictor offers additional safety but does not interfere with the performance when not activated which may be important for inflating a rescue cushion. It can be retrofitted at any time.